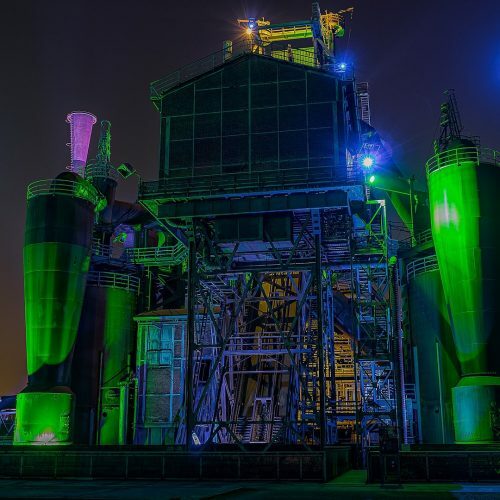 In this blog post I want to quick go through one of useful capabilities that Microsoft provided with version 2 of Azure Data Factory. As a developer I always want to use code repository to keep all my changes, to manage tasks, branches, share the code with a team and simply… keep it in safe place. That works very well for many years for various code of applications as well as database projects (SSDT). But how to use code repository for tools who shares UI via browser as ADFv2 does? Doing a copy of exported ARM templates and committing them manually to code repository isn’t efficient, repeatable and no-errors burdened process, after all. 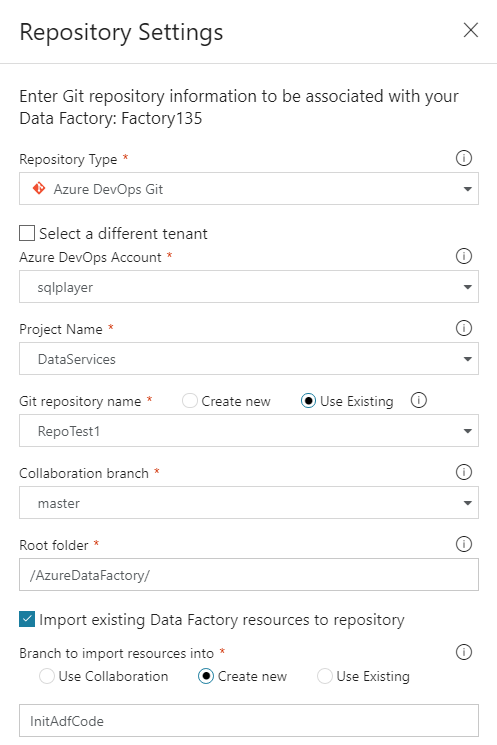 We can attach a code repository to the Azure Data Factory v2. You can do that for existing factory or for new one and let’s assume that you already have got a Git repository. 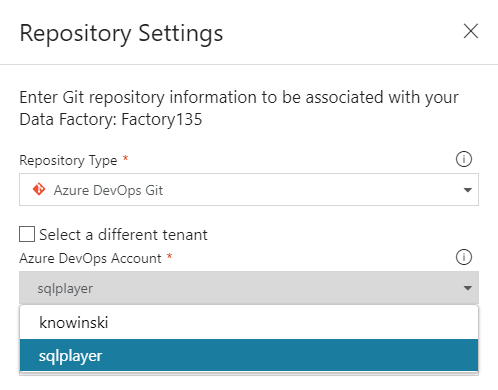 Microsoft supports Git in Azure DevOps (formerly VSTS) only as GitHub repositories would be enabled in GA version of factory. Subsequently you must select Git repository name. 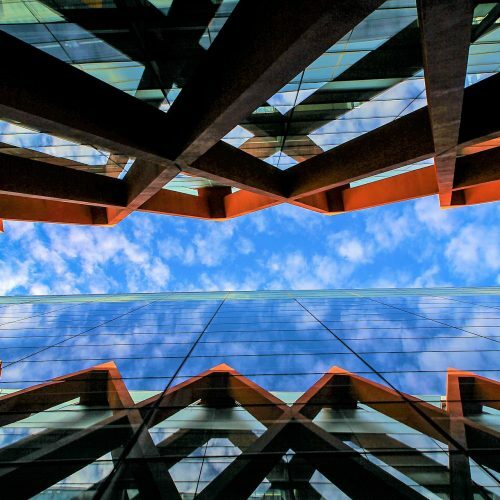 In this step you can create new repository or use an existing one. In this case, I used an existing repository called “RepoTest1”. Having that, do point out to “Collaboration branch” which is your Azure repository collaboration branch that is used for publishing. By default it is “master”, but you can change it if you want to publish resources from other branch. In “Root folder” you can put the path which will be used to locate all resources of your Azure Data Factory v2, i.e. pipelines, datasets, connections, etc. Leave it as is or specify if you have more components/parts in the project’s repository. That option allows you to make a initial commit of your current ADF into selected branch in the repository. Select the option when your repository has just been created or target folder is empty. Otherwise, you will get started with an empty project (synced to repo) whereas your existing project is left unassigned. Once you click button “Save” – new branch is creating and one commit containing all resources (as JSON files) will be made. The following picture shows newly created branch and structure of folders. Structure of folders. Familiar? Certainly. At any time you can change working branch selecting required from the list. We are able to publish an edited ADF which generate publish branch which contains ARM templates that can be used for deployment purposes. Beforehand you must merge your changes from working branch to the master (or other branch pointed as collaboration branch). 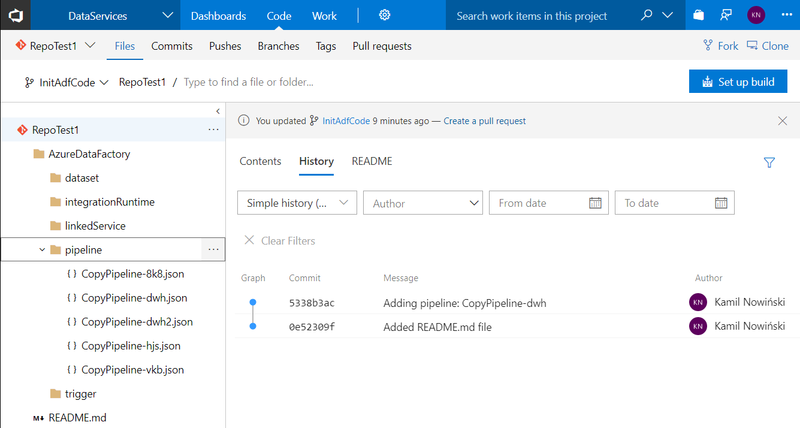 To achieve that – use action Create pull request [Alt+P] (top-left corner) which does nothing but redirect you (in new browser’s tab) to project in Azure DevOps on a site with New Pull Request. Default direction is a “collaboration branch” (i.e. master) which can be the only source you can publish from. I’m not going to cover that topic in this post at all. Clicking the icon you will gain access to information about attached GIT repository. At the bottom you’ll find “Remove Git” button. Once finish that – you can repeat the assigning process from the beginning. Hi Sachin. I had this issue at the beginning on my private Azure account. Once I connected my Azure DevOps Services (formerly Team Services) to AAD (Azure Active Directory) – Azure DevOps Account should be available on your list. Let me know whether that helped. 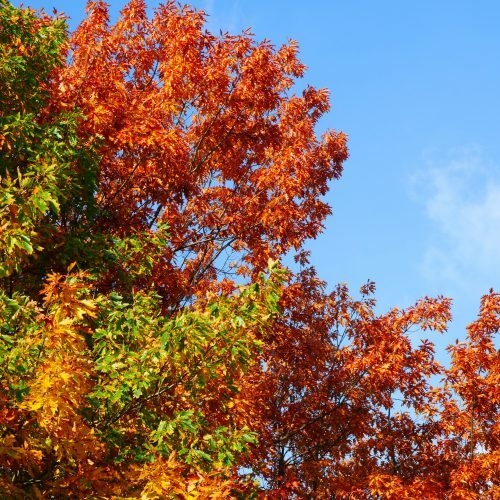 Great article – thanks for publishing & sharing. On a separate note I can’t figure how to subscribe to SQL Player so I get notifications of new articles? Is there a way to subscribe? Hi Steve. Thank you very much for your kind opinion. The blog is fairly young and there is still no option to subscribes new posts. Certainly, this will be changed pretty soon and I will inform you then. Thanks for your article. I have a question I haven’t been able to answer by googling. 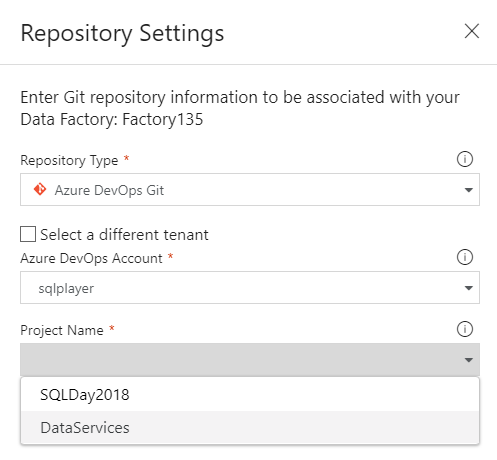 If I want to integrate Data Factory with azure devops, then you need to create a devops project first. When I try to do it, I see .Net, Node.js, PHP, Java. Static Website, Python, Ruby, Go, C and “bring your own code” options. ¿What option should I go for when creating the project? You’re welcome. This article does not address the deployment of ADF with Azure DevOps. There is no dedicated template for ADF yet (as I assumed you stuck there building new pipeline), so you can use an empty one. Adding a task – choose ‘Azure Data Factory’ from Marketplace or create a PowerShell script. I will prepare a post about it soon (hopefully).